I scooped up the material for the first lesson in my new series, “Easy Finnish,” from the lawn as I was walking my trilingual dog Cholmondeley amid the famous tower blocks of Linnala, in ancient Imatra’s stuck-in-the-seventies Mansikkala neighorhood. Apparently, the local smokers not only want to kill themselves. They also want to kill us with their trash, at least in the formerly picturesque Linnala. I say “formerly,” because Linnala/Mansikkala will soon have more commercial retail space in terms of square meters per capita than any other similar neighborhood in Finland, for sure. More about that, below and later. Now we have to try and learn some Finnish. Here we are reminded that Finland has two official languages: Finnish and Swedish. 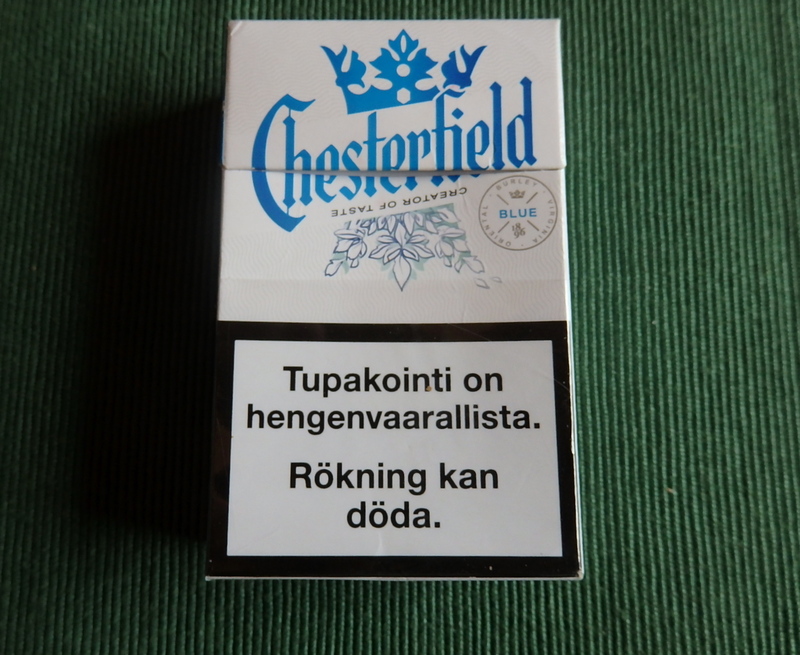 The Finnish speakers are told that smoking (tupakointi) is life-threatening (hengenvaarallinen; the word is in the partitive case here). It sounds all very official and thus not to be taken too seriously. The language pulls no punches. Even a foreigner like me, whose grandfather’s native tongue was Swedish, but who has never had a single Swedish lesson in his life, gets the message. All Finlanders, Fennophones and Swedophones alike, study both languages at school. In reality, the eastern part of the country, where Cholmondeley and I dwell part of the year, is utterly devoid of actual Swedophones. A friend of mine once told me he tried to read a few Swedish-language novels a year to keep his school Swedish up. A couple of years ago, however, some of his neighbors launched a so-called people’s initiative to make the teaching of Swedish non-obligatory in Eastern Finnish schools. Fortunately, in March 2015, the Eduskunta, the country’s parliamentary, had the wisdom to smack down that stab at destroying the country’s identity. Unfortunately, at the same time, they voted up an initiative that would permit kids living in the east of the country to study Russian instead of Swedish at school. This nice-sounding but ultimately empty gesture was part and parcel of the same consumerist-driven Russophilia that, fueled by the relative prosperity of Petersburgers and Muscovites a few years ago (before Putin’s desire to become Master of the Universe and a big drop in the oil price tanked the Russian economy), caused the big towns of South Karelia, Lappeenranta and Imatra, to start reshaping themselves, often in stupid and destructive ways, to accommodate the Russian tourist-shopping boom. Now, just a few years later, the boom has almost completely dried up. In any case, judging by what I have read in the press, none of this commercial frenzy has had any effect whatsoever on what foreign languages Finnish kids want to study, whether they live in the allegedly Russophilic east or the Russo-indifferent west. They still want to study languages that will have some utility for them as citizens of a European Union country and a globalizing world—German, French, and, above all, English. Finnish legislators, on the contrary, apparently think the brightest dream the young people of South and North Karelia harbor for their lives is working in the tax-free checkout line at K Market, S Market or Lidl, where they can employ their high-school Russian to best effect. Until recently, at least, you would see lots of empty Russian cigarette packs littering the yards, byways, beaches, and woods of Imatra, which is situated smack on the Russian-Finnish frontier, and is home to one of the country’s busiest border crossings. These packs were probably not tossed on the ground by environmentally unfriendly Russian tourists and shoppers (although they would think nothing of doing just that in their own heavily polluted homeland), but by Imatrans themselves, unbelievably, especially since ten or so years ago you would have look hard to find any litter on the ground in this now-tarnished little gem of a town. For the past several years, however, the locals have been taking advantage of the relative cheapness, in neighboring Russia, of certain vital goods like petrol, fags, and booze to dash across the border to Svetogorsk (the former Finnish town of Enso) to fill up their tanks and load up on cigarettes and hard alcohol. But a new rule has come into effect (I forget which side instituted it) that obliges Finns to spend at least 24 hours on the Russian side of the frontier to be able to bring back three cartons of cigarettes. That might put the kibosh on the once-routine petrol-and-cigarettes runs to Svetogorsk, but it might also ramp up the clandestine cross-border trade in some of those goods, which has been booming in parallel with legal commerce these past ten years. In any case, the Swedophones have it right: smoking can kill.